← Hounds of Love released 30 years ago today! 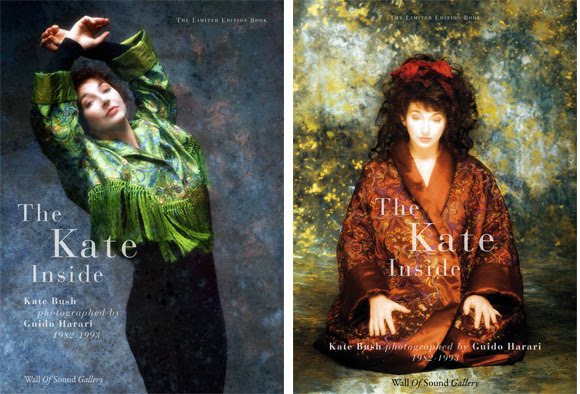 Photographer Guido Harari and Wall of Sound Gallery are launching a pre-publication offer on the upcoming lavish photo book, “The Kate Inside” which will be shipped in early March 2016. 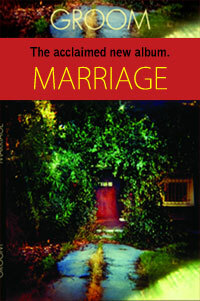 The gallery website has all the details here. “The Kate Inside, Guido Harari’s lavish tribute to one of the world’s greatest music geniuses, is finally happening to ya! 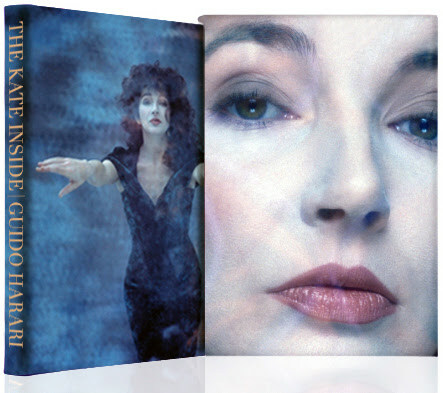 Guido’s collaboration with Kate Bush spans from 1982 to 1993. During that period he was invited by Kate to shoot her official press photos for landmark albums like Hounds Of Love, The Sensual World and The Red Shoes, including a completely never-before-seen reportage on the set of Kate’s film The Line, The Cross & The Curve. Accompanied by Guido’s own commentary, The Kate Inside is packed with more than 300 hundred photographs. They include all of Guido’s classic images of Kate, a wealth of outtakes, contact sheets, unseen photographs and other materials (including test Polaroids and personal notes by Kate) taken from his personal archives that are showcased here for the first time. L to r: A never before seen photo from the 1985 shoot for Hounds of Love; Kate with dancers Gary Hurst (l) and Douglas McNicol (r) in 1982 during the promotion of The Dreaming. This was Guido’s first shoot with Kate; a classic double exposure from the “blue” sequence shot in 1989 for The Sensual World. 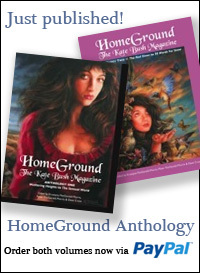 “The Kate Inside is a limited edition book of 3000 copies worldwide. It’s available both as a Deluxe Edition (520€ -25% = 390€ for copies numbered 1-350) and a Regular one (120€ -25%= 90€ for copies numbered 351-3000, all personally signed by Guido). “The Deluxe Edition will be limited to the first 350 copies, all personally signed by both Guido and Kate’s legendary mentor Lindsay Kemp, who has also written a special foreword for the book. Presented in a solander slip case, the Deluxe will have a full leather cover and will feature extra pages! L to r: another classic image from the 1985 shoot for Hounds of Love; a never before seen photo of Lily from Kate’s film The Line, The Cross And The Curve, 1993; a funny pose from the 1985 shoot. S P E C I A L E X T R A S T O O ! 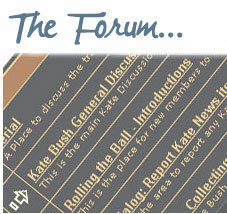 ALL GUIDO’S KATE BUSH FINE ART PRINTS DISCOUNTED! L to r: two never before seen images from The Line, The Cross & The Curve, 1993: Kate in red shoes and with Lindsay Kemp; Guido, Kate and Lindsay on the set of The Line, The Cross And The Curve. Will this offer be available to those of us in America? I would imagine so, the gallery is based in Italy and they will take online orders – I would just check postage costs when they make the pr-order available? Shipping costs (to Italy, Europe and non-Europe) will be indicated in our order form. We ship securely with FedEx. Guido’s book looks absolutely stunning. I love the smaller one he made last year. Between this and John’s book, it’s turning out to be a nice KT autumn. Thank you Blackbird Braille! I hope you will enjoy the new “big one”. Hi Guido, I’ve ordered everything this morning, just six months to wait! Do you know what image the exclusive print Is? Did you contact Kate to notify about this project and is she supportive? I was eleven when Wuthering Heights came out, and the glut of great books in the last year, including yours, showing photography throughout her career is a joy. Regards, Edward. Thank you Del! I really appreciate your comment. It was fantastic to see you again at the Convention in Birmingham after all these years.